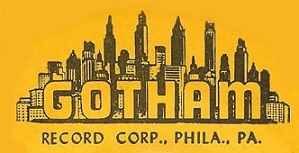 A notable, but rather minor, independent label begun in 1946 by Sam Goody (the retail discount store founder) in New York before Ivin Ballen, who owned a record pressing facility, bought him out two years later, moving its operations to Philadelphia. The company’s roster was decidedly eclectic with Latin music sharing space with blues and gospel (the latter of which became its most frequent output), and eventually rock ‘n’ roll. Beset with the usual obstacles to success all independent labels face, including a lack of distribution and promotion, and despite never having a bankable artist to act as the public face of the label they weren’t completely insignificant in rock’s evolution and managed to last through multiple eras and styles of rock ‘n’ roll. Their fatal flaw was failing to capitalize on their best rock artists – Earl Bostic and much later Lee Andrews & The Hearts – ultimately seeing them depart for greener pastures where they scored hits for other labels with songs originally recorded for Gotham. Missing out on the much needed cash flow and name recognition they might’ve gotten as a result the label was fighting a losing battle to remain viable. In spite of this they still managed to release some important sides along the way by the likes of Jimmy Preston in the late 40’s and early 50’s and The Capris in the mid-50’s before quietly folding in 1956.